Minnesota Vikings quarterback Matt Cassel scores on a 6-yard touchdown run against the Eagles. MINNEAPOLIS — Matt Cassel stopped his backpedal, looked ahead and saw the Philadelphia Eagles’ defense part down the middle the same the Minnesota Vikings’ defense did in practice during the week on a designed run. Cassel took off and was untouched on a 6-yard touchdown run to give Minnesota a surprising 24-9 lead in the third quarter, against Philadelphia, which had won five in a row. The play unfolded just like the Vikings and Cassel had practiced. He never thought the same would occur in Sunday’s game. Cassel and the Vikings (4-9-1) found space all game long against a Philadelphia defense that hadn’t allowed more than 21 points in a game since Week 4 and had held teams under 300 yards passing the past four weeks. Without injured running back Adrian Peterson, Cassel took the game in his hands and was 26 of 35 for 382 yards passing, three total touchdowns and an interception. With receiver Greg Jennings hauling in a career-high 11 catches for 163 yards and Jarius Wright adding a career-high 95 yards receiving, Cassel threw for the most yards by a Minnesota quarterback since Brett Favre tallied 446 yards on Nov. 7, 2010. The Vikings scored their most points in a game since scoring 50 points on Dec. 20, 1998. “We got a special group in that (receivers meeting) room, and it’s almost as if we fly under the radar because of our running game and because we don’t throw the ball as much as other teams across the league,” Jennings said. “But when we have an opportunity to make plays, this is what can happen. And when we have a guy that’s back there who’s divvying it up and spreading the ball around, and the offensive line did an outstanding job all afternoon. Cassel has been the lubricant to the Minnesota offense, at least to the after-thought passing game. With the Eagles’ big-play offense facing a short-handed Vikings defense and without the team’s top two running backs in Peterson and Toby Gerhart, Cassel took control. He hit his first nine passes, including a 57-yard touchdown to Jennings. Minnesota has four pass plays of 50-plus yards this season, all by Cassel. His 90.7 quarterback rating leads the team and he has nine touchdowns and five interceptions. The 31-year-old veteran is the efficient, consistent starter the Vikings hoped Ponder would become, and he adds one piece Christian Ponder (36 career games) can’t. In five games of playing at least a half, Cassel has thrown for at least 241 yards, a total Ponder hasn’t matched once this season. Yet, Cassel was repeatedly passed by for Ponder — and one game for Josh Freeman — as the Vikings season slipped away. Cassel’s performances have added another chapter in the “what might have been” of Minnesota’s seasons with inconsistent quarterback play and a defense that has faltered in late-game situations. Cassel is doing just that. There won’t be any midweek quarterback questions. Frazier has already said Cassel will start next week at Cincinnati. “He took advantage of this opportunity,” Frazier said. “He’s played with so much poise each time he’s got in the ball game, whether he’s coming in relief or in this case, starting. He’s done some good things. Credit to him because it has not been easy. Cassel is seizing the opportunity Ponder wasn’t able to this season. 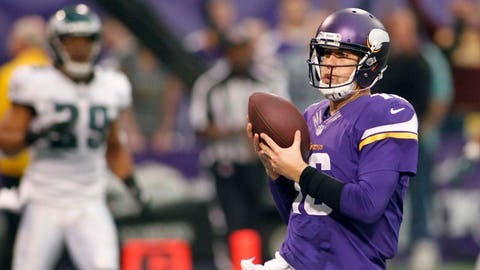 Ponder, the team’s first-round draft pick in 2011, returned as Minnesota’s starter. Cassel, after losing his own job in Kansas City because of a concussion, came to town as the backup. Ponder continued to work through erratic play and injuries. Cassel continued to go about his way, not causing any disruption and preparing himself for his chance.